Saves approximately $376 per year—that’s $3,760 savings in energy costs over a 10-year period. 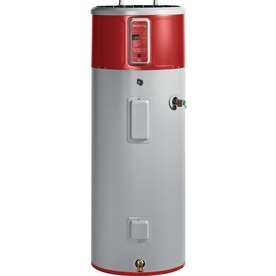 Uses less than half the energy compared to a conventional 50-gallon tank water heater. Operates at 550 watts in Heat Pump mode vs. 4,500 watts in standard electric mode. Reduce water heating operating costs by approximately 67%. Reduce 62% CO2 emissions from the US grid associated with water heating. Save up to $3,760 over a 10-year period based on the national average electricity cost of 12 cents per kWh. If just 25% of U.S. households purchasing a new electric water heater in a given year were to choose GE’s hybrid water heater over a standard 50-gallon electric water heater, more than 4 billion lbs. of CO2 emissions from the U.S. grid could be avoided annually. That’s equivalent to the annual emissions of more than 360,000 cars on U.S. roads. Thanks for contacting us! We'll get back to you, asap.